The 3 days Mount Nyiragongo volcano hiking – climbing safari in Congo is a short volcano hiking tour in Congo that gives you an opportunity to hike up to the summit of the most active Volcano in the world. 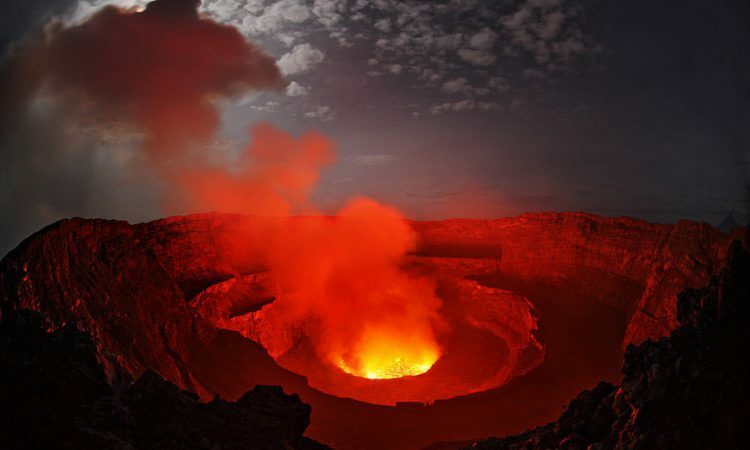 Nyiragongo is a beautiful strato volcano that features the world’s largest lava lake. Explore Rwanda Tours will take you to this mountain for an adventure of a lifetime. The volcano’s forested lower slopes are home to a variety of animals, including chimpanzees, monkeys, and bush buck. Nyiragongo’s summit rim is largely devoid of vegetation and is frequently dusted with snow. From the rim, you can peer down into a churning lava lake and see and hear hot gases exploding up though a mosaic of molten lava. Upon your arrival in Kigali international Airport, you will be welcomed by our professional driver guide who will transfer you to Goma, DRC. The drive journey of 184kms about 3-4 hours without enroute stopovers to Goma is a breeze because of the excellent roads/transport in Rwanda to the border. When you cross the border, you will start feeling the excitement of Congo. On arrival to Goma town, you will advance to the lodge to check-in, have dinner and overnight. Accommodation: Mbiza Hotel for luxury, VIP Palace Goma for Mid-range and Hotel la Versaille for shoestring. After breakfast, you will embark on the transfer to the mountain trail head at Kibat Patrol Post in Nyiragongo Volcano. Beautiful drive with Nyiragongo towering above its own lava flows from previous eruptions. On arrival to the trail head, embark on the climb of about 5-6hours to the top of the Volcano. You will be accompanied by two armed rangers / guides who speak English and French. Your hike to the summit of the volcano does not only reward you with spectacular view of the flora and fauna gorgeous at lower elevations, but you also give a local person a job. When you get high enough, the views of over an old crater to Lake Kivu are stunning. Of course, those views are nothing compared to when you reach the crater and see the lava pool inside which is simply incredible. The night will be spent in tents on the rim of the giant crater, high above the active lava lake. Accommodation is in simple but comfortable A-frame huts on the crater edge. Warm clothes and a sleeping bag are essential as it will be very cold and windy all night. After an early morning breakfast, you will begin your descent by 7:00am from the summit of Nyiragongo to the head trail in Kibat Patrol Post. Arrive at the trail head before lunch and transfer back to the lodge to have lunch and relaxation. After lunch, embark on transfer from Goma to Kigali. On arrival to Kigali, the driver guide will drive you to your Kigali lodge or drop you to Kanombe Airport for your scheduled flight back home.